What Good is a Stinkin’ iPad? My husband and I bought an iPad for my dad, but he decided he didn’t really have use for it (i.e. he uses his laptop and his phone and can’t get Java to work on the iPad so he can’t play ba-dook on it). So now we are deciding whether to take it back or keep it for us–How useful is it really? You can’t edit documents or talks on it can you? Is it good for taking notes at conferences? Isn’t the wireless plan expensive on it? I pretty much bring my Mac everywhere with me, but I’m not sure it’s more than an indulgent toy for us. Hi Sung Yun. I have been asked this same question many times and can answer in the affirmative that tablets are overall great for reading and looking at stuff on. For editing and taking notes, it depends on what you are used to. And for portability, tablets>laptops. Tablets in general get a lot done, and of the tablet choices that you have, the iPad is still, for now, the best tablet a lot of money can buy. I went all in when the first iPad came out, buying not one but two iPads. It occurred to me from the start that the pain of lugging my 15 inch Macbook Pro was soon to be relieved by the magic iPad, but I was worried that I would not be able to multitask. I normally keep several desktops and multiple windows going at the same time on my laptop, and to get a similar functionality from tablets, I feel you have to have multiple tablets. I also figured two iPads were still more portable than a single Macbook Pro (2007 issue). The first great use of the iPad was as a reader. I own several Kindles and while I love reading books on my Kindle Paper White 3G, I equally enjoy reading them on the larger screen of my iPad. The skeuomorphic iBooks with their faux page turns are fun, but the iPad Kindle App with an Amazon Prime Account is reading heaven. Toss in FreeBooks app that feature everything out of copyright, and you have a public library in portable form. Overdrive reader app lets you access your local public library -you can look up and check out eBooks from your library! If you read magazines, most magazines feature an iPad App. Harder to find magazines can be found in newsstands like Zinio, but the killer app for magazines is Next Issue which for a monthly 8 to 15 dollars features hundreds of magazines like Esquire, Time, and People. I can’t live without my New Yorker magazine, and now rather than a mess of magazines around the house, they are all in my iPad. The next use of the iPad is as a portable widescreen TV. While iTunes lets you purchase and then download movies and TV shows from iCloud onto your Mac, AppleTV, or iOS device (iPad, iPod Touch, iPhone), the streaming app trio of Hulu, Netflix, and Amazon Prime gives you access to thousands of current and vintage movies and television shows. Hulu Plus, a monthly subscription, gives me access to every episode of South Park, the Daily Show, Colbert Report, Community, and The New Girl. 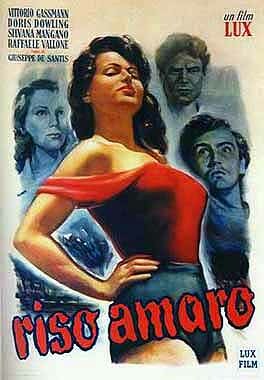 It also features the Criterion Collection of critically acclaimed but difficult to find foreign films -I am in the midst of watching Riso Amaro (Bitter Rice), an Italian post war film of lust and crime in the Italian rice paddies. Netflix has a great selection of movies and TV shows as well, and the ability to have DVD’s mailed to you. Amazon Prime’s video player also features many recently released films for streaming, and beats iTunes by letting you stream rather than download then watch rental movies. Amazon also has every Ken Burns documentary, if that is your thing. The third feature is up to you to decide if you want in the house. The iPad is a great gaming platform. While not as immersive or complicated as an XBox, Wii, or Playstation, games on the iPad are no less fun or addictive. Words with Friends pops on a larger screen. Pinball is a great stress reducer. My boys play all manner of games -most of which are free or cost 99 cents which is a lot cheaper than the average XBox game. The utility of tablets is that eliminating the keyboard frees you to interact with the computer in a far more natural way. Drawing and music creation are two ways I put mileage on the iPad. My favorite art app, Paper, was the App Store’s App of the Year last year, and I doodle constantly. The Brushes app is used by David Hockney and other artists to create serious art. I frequently use Adobe Ideas to sketch on top of CT scans for patient consultations. For note taking, there are innumerable apps for taking freehand notes and the better ones allow you to record the presenter’s audio synced to your notes. My favorite second brain app is Evernote which lets me data dump important files, notes, and ideas for access across all my gadgets. If you type fast, you probably aren’t going to change note taking tasks but I have to mention that it’s less intrusive to write notes on iPad than click clack away on a keyboard. This brings me to the last part -work. 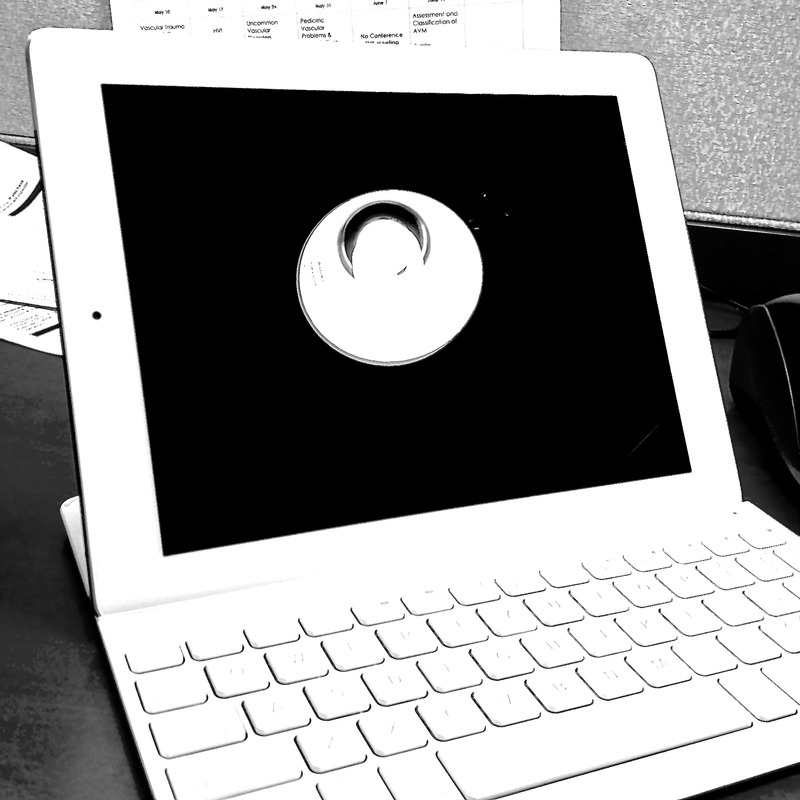 I composed this blog entry on an iPad using the Logitech Slim Keyboard Case, which I recently reviewed. It turns the iPad into basically what the Microsoft Surface wants to be, a post-laptop work device. While Office for iOS isn’t out in the wild yet and probably never will be, there are many options for writing and editing. Pages is a good word processor, but Word is more universal and more importantly has collaborative editing and version control that is superior to anything on iOS. That said, Pages is unmatched in its ability to layout documents. That’s how I use it -after composing the content in a simple text processor like iA Writer, I open up and prettify it in Pages and save it as a Word file for sending out. For presentations, Keynote is how I make all my presentations. I can make them on the fly during and after cases to present complex operations to patients and their families. You can export into Powerpoint or PDF, but equally powerful is the ability to present directly off your iPad, either via a cable or wirelessly to an AppleTV (an unpromoted feature). The usual way I create presentations is I upload all the pictures and graphics to a Dropbox folder and then compose the presentation on my iPad after taking intraop photos with my iPod Touch or iPhone. I’ve uploaded a sample presentation SFA-POP-Tibioperoneal Trunk EndoRE that I created right after a case for explaining what I did for a patient’s family. The wireless plan is pricey if you’re not needing it, but I find it indispensable because my iPad 3 with Verizon 4G has a hotspot function which will allow me to tether other devices like a Macbook Pro or iPod Touch at high speeds. The typical use scenario is on long car trips where the iPad is the hotspot for streaming video to the boy’s tablets and I listen to This American Life episodes (every episode ever is available on their app). In a pinch, the iPad can act as a ridiculously large phone via the Line 2 app, which gives me a phone number (in Manhattan no less) for non-work use. Now here is the last tip -I suggest you trade in your iPad for an iPad Mini with Verizon Wireless. The big screen is great, but impossible to carry around the hospital in a white coat. The 8 inch size fits perfectly. I’m holding out for the retina display iPad Mini which hopefully is next. For now, my Android Tablets fulfill this in the pocket function, and match the iPad largely feature for feature except for speed (they are older single processor devices) and ease of use. I think if you are adventuresome, the Nexus 7 is probably hits the sweetspot of price (about 200 bucks) and size (fits white coat pocket), but for cheaper, you don’t get the cellular wireless or nifty form factor, and you have to geek out on Android. 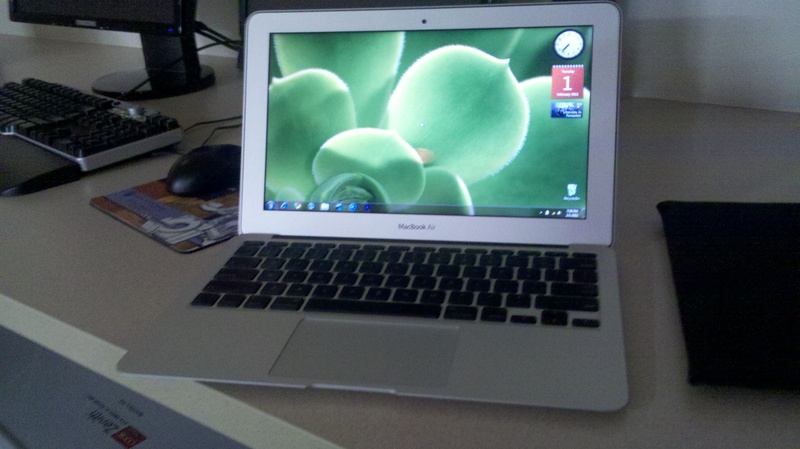 This grainy photo above shows my shiny new Macbook Air running (GASP) Windows 7. While this feature has been available via a utility called Boot Camp, I had always run Windows XP in virtualization, first in Parallels, and currently in the open-source (free) Virtualbox. That said, I wanted a faster option, particularly to see if this set up would run 3D CT analysis software well. My current home workstation, a Dell desktop replacement laptop, slows to a crawl when I run this software, but something told me it may run better with the flashdrive enabled Macbook Air. To the Apple Store to buy a Superdrive. I tried various ways of creating a bootable USB flash disk, but after several hours, decided to take the plunge and purchase the MacBook Air Superdrive. The Boot Camp setup was a little annoying -you had to download Boot Camp drivers and burn a CD to load onto your Windows drive. You then had to partition the hard drive -I initially set aside 25 Gb but now find that I am running out of space as I load up with necesary software. After a few days of fiddling, and running it in Windows, I have to say I am surprisingly pleased. Windows 7 is as beautiful as Windows XP is mofugly. It anticipates your needs and just works -for example, drivers for my network printer were automatically downloaded upon adding it to the printer list. This sort of ease of use used to be associated with Mac OS only, but Microsoft has finally bit the bullet and realized that the “for business” label was just an excuse for keeping things arcane and difficult. Getting XP to recognize a network printer is a Sisyphusian task. Windows 7 does it with elan. Strangely enough, I am enjoying working on Windows 7. Sure -the fonts aren’t as good looking, but the OS is polished and refined. Frankly, I love it. The 3D CT software runs as well from my home as it does in the office on its server (a Dell Xeon PC which is monstrously huge). I am loading Office on it. During the late ’00’s, Microsoft seems to have gotten the message that their software was preferred by geeks, but generally despised by an increasing number of people. What always kept be away from Windows 7 was the terrible hardware available -I had miserable experience with Sony and Dell, and am dubious of any of the large PC makers. Boot Camp and Macbook Air changes all that. Oh, the virus thing -Microsoft now offers a free download called Microsoft Security Essentials which does a decent job of policing the computer. Kudos to Microsoft and here’s to hoping much luck and fortune to that other iconic American company.